If you don’t like it, don’t look. I only ever met my paternal grandmother once when I was four-years old. I remember her as dour and commanding – a woman who had lived in Berlin during both World Wars and had experienced starvation, economic depression and war crimes. She was also a diehard (pun intended) smoker. I was a pint-sized but vocal anti-smoking campaigner. She would light up a cigarette and I would tell her that it was killing her, that it was killing me to see her smoking, that it was a bad thing to do and on and on and on. Not a woman to be dictated to by anyone, least of all a preachy child, her response was a stern and nonnegotiable “If you don’t like it, don’t look.” Please keep in mind that in 1969, no one knew about the dangers of second hand smoke. “If you don’t like it, don’t look.” It’s not an invitation to avoid seeing what’s unpleasant in the world. Those things need to be seen and known about. 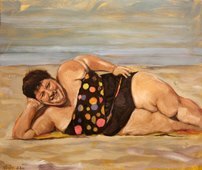 Who hasn’t heard a woman say “I’d never go to the beach looking like this. I’m too fat/pale/lumpy.”? And I mean it. Go out and do whatever you want and remember, if “they” don’t like it, “they” don’t have to look.